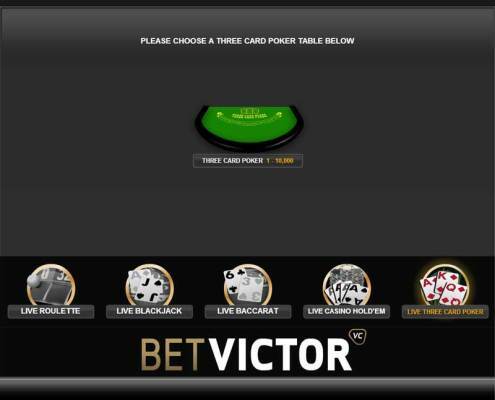 BetVictor are another online casino that can offer players the choice of RNG or Live 3 Card poker to players. In this case they are from different software manufacturers so you do get a different playing experience at both. The live version offers the additional 6 card bonus while you can play for free on the RNG version. Different software used for Live & RNG games. On Pairs Plus straight pays 5:1 on Live, 6:1 on RNG! 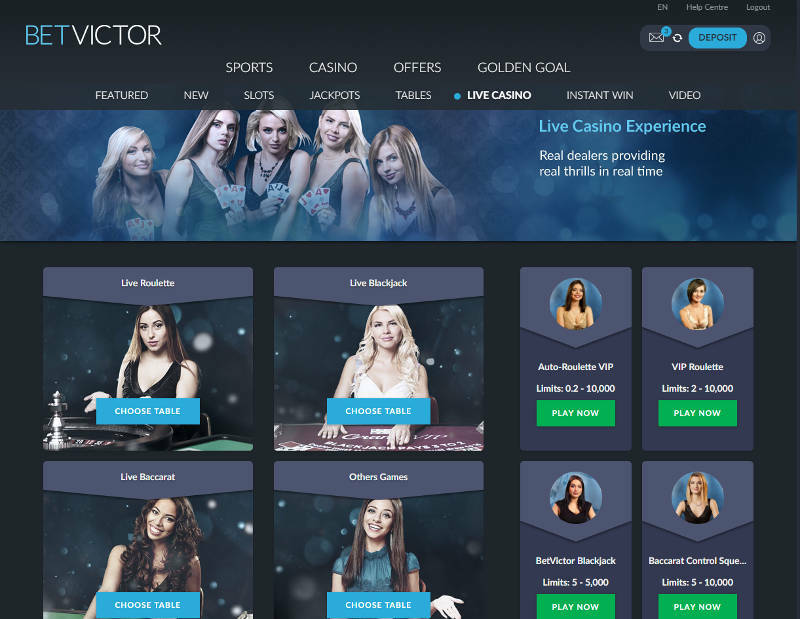 BetVictor are known for their Sports Book, In Play betting and their huge variety of online casino games, slots and having the most Live Casinos of any online casino, coming in with a hefty 5! They have an awesome selection of online casino games. They are virtually a one stop shop for everything you could possible need. For 3 Card Poker lovers you have the option to play RNG 3 Card Poker from Amaya at the BetVictor Casino or Live 3 Card Poker at the BV Grand Live Casino that is powered by Evolution software. What’s more you can also play the RNG game in demo mode.! This is a one player, one handed game, with a Pair Plus side bet from Amaya Gaming. One card pack is used and this is shuffled before every new hand. You have the ability to play just the Pair Plus bet if you’re not interested in placing an Ante Bet. You can choose from one of five different stake levels that range from £1 – £100 through to £500 – £10,000 , so there is something to suit all levels of player. This can be found at the BV Grand Evolution Live casino. You will be playing on a table shared with other casinos but only one hand is in play and you don’t get to see what other players are betting. The deck is manually shuffled after each hand and there are two side bets that can be played, Pairs Plus and 6 Card Bonus. Stakes start low at £1 and go up to £10,000 a hand. 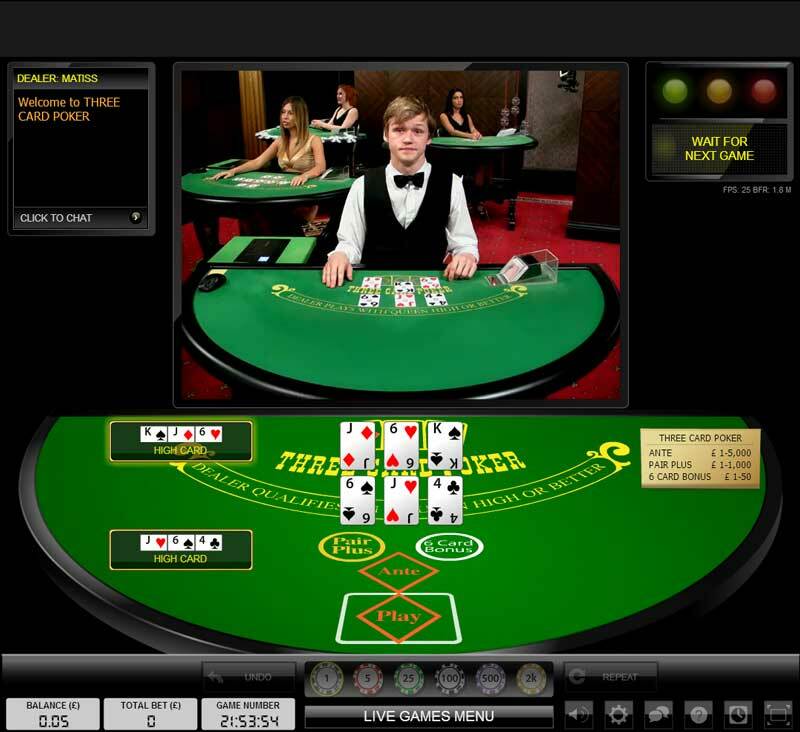 No download is needed to play either game and you have the option to play the RNG 3 Card poker game in fun mode. 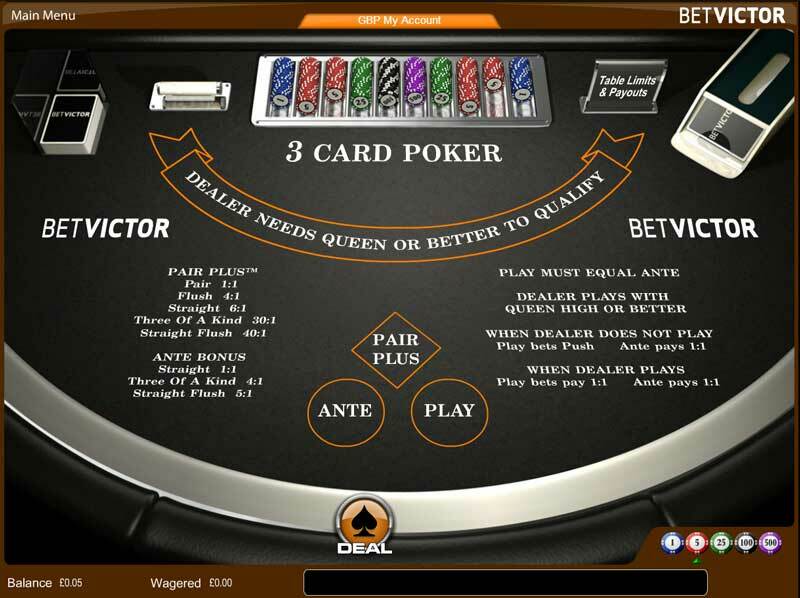 Live 3 Card poker can be found at the BV Grand Live Casino. As you can see from the images once you are at the table there are two ways to view the table. Classic View mixes live video feed with computer generated images. This is useful if you have difficulty in seeing the cards or if your connection is a bit laggy. The 3D view is just the live video feed. You still get all the options of classic view but no computer generated image of the table and cards. 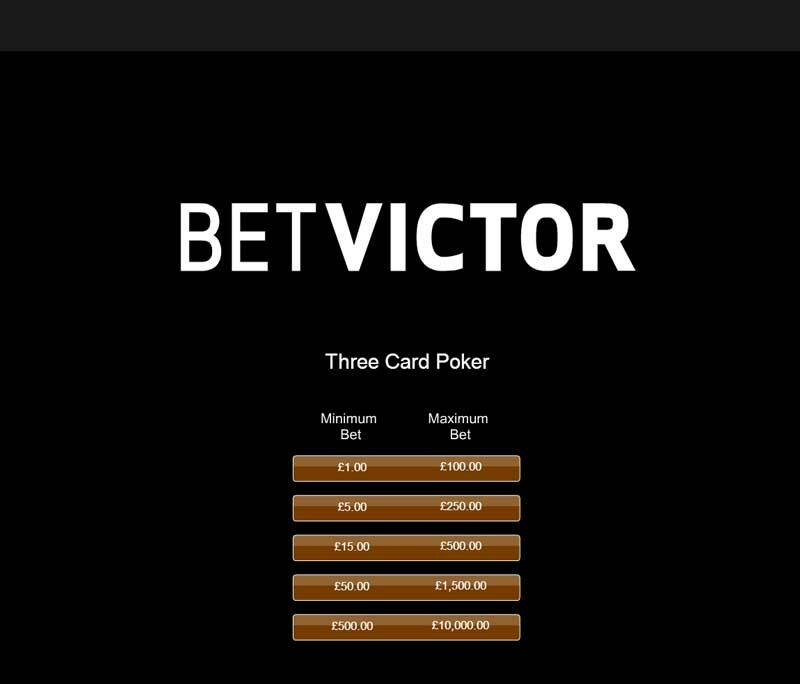 The RNG 3 card poker can be found at the BetVictor Casino and the quickest way to find it is to select Table games from the menu. When you fire it up you’ll get a menu of stake options. Pick the one you want and the game loads up in front of you. This game can also be played in demo mode and if you scroll down a bit you’ll be able to play for free. See the BetVictor Website for latest promotions. The Customer support at BetVictor is very good. You’re able to contact them 24 x 7 by Email, Telephone and Live Chat. I’d encourage you to use the Live Chat if you have any questions about playing at BetVictor. I’ve always found them to be efficient and able to answer my queries. There is also a very good online support area with a range of FAQ’s, so it’s worth checking these out as it can save you some time. BetVictor have all the major payment methods covered. You’ll be able to use Web Wallets like Neteller, Credit & debit Cards , Bank Transfer and numerous other brands falling into those categories. Do read the small print about withdrawals, it’s nothing sinister, but generally you can only withdraw using the same method as you used to deposit. Promotions are run regularly at BetVictor, however ones playable on live casino games are limited and 3 card poker even less so. I would recommend reviewing what they have on offer regularly. 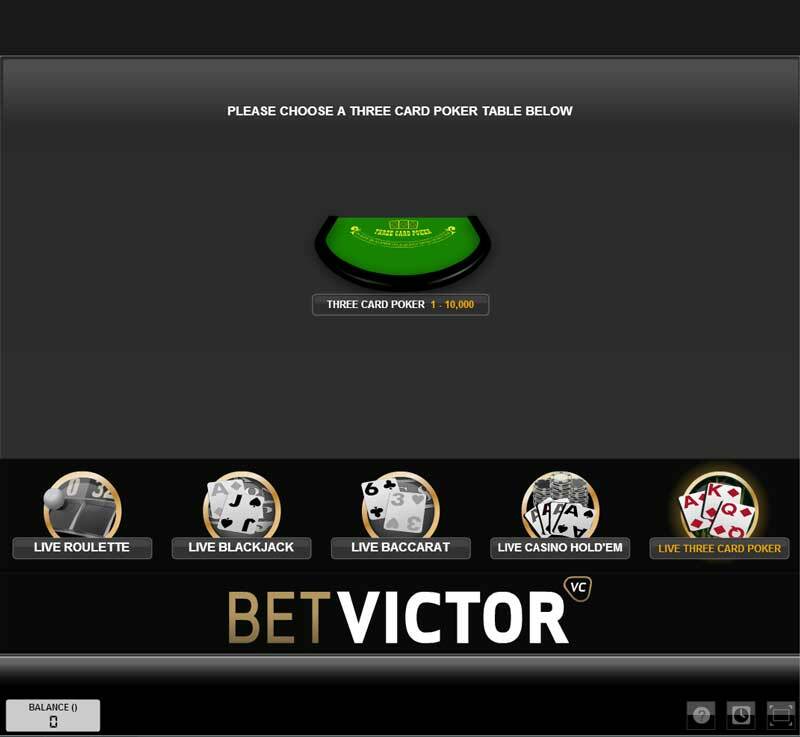 BetVictor can be your one stop shop for Online Gaming. 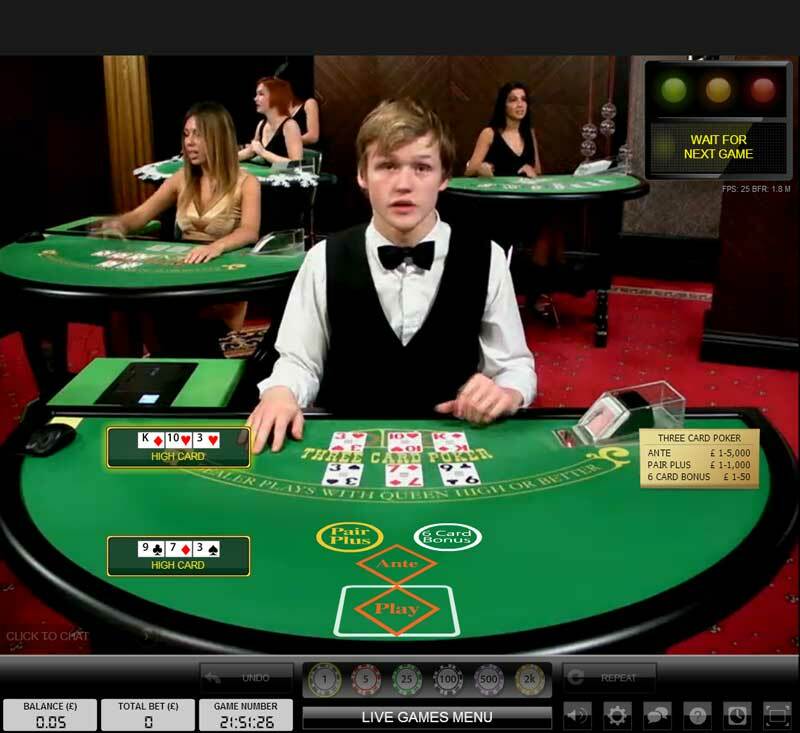 You have the choice of Live 3 Card Poker or the RNG version or maybe you want to play both at the same time!